Shop this collection of elegant gala dresses and long formal evening gowns to find a look that you’ll love to wear for your next gala event. These stunning black-tie dresses and formal dresses for galas include beautiful long dresses in a variety of styles, colors, and fabrics. Best of all, these quality gala dresses come at all price points, so you’re sure to find an ideal formal evening dress within your budget. Choose an elegant black-tie dress for a special event at night or a sophisticated long dress for an upscale afternoon event. Alluring long dresses with deep v-necklines, full and fabulous ball gowns, or trendy two-piece beaded long dresses for galas are perfect for banquets or charity balls. For a fundraising gala, try a sweet and romantic strapless gala dress or delicate long chiffon dress with illusion cut outs. 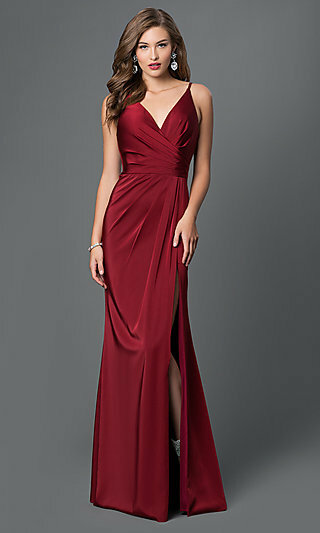 Whatever your personal style or budget may be, Simply Dresses has you covered for your special gala event. What is a Gala and What Should I Wear to a Gala? Typically calling for an evening gown, a gala or charity ball is a coveted formal affair or social gathering, often in celebration of an achievement or an effort to raise funds for a charity. If you are wondering whether to wear a simple formal evening dress or luxurious long evening gown with all of the bells and whistles, first look to the invitation for the dress code, but don’t forget to add your own distinctive style! The invitation will usually say whether it is a white-tie, white-tie optional, black-tie, or black-tie-optional gala. Read on for specific rules for these dress codes. White-Tie Galas: Often featuring a celebrity guest list, white-tie galas call for elegant long gala dresses, luxurious formal evening dresses, or sumptuous floor-length ball gowns that expose the arms and showcase the decolletage. Long white gloves are a must, ladies! Gentlemen should arrive in a black dress tailcoat, matching high-waisted trousers, a stiff white wing-collared shirt, cufflinks, a white vest, white bow tie, and white or gray gloves (top hat is optional). A white-tie-optional gala still calls for lavish long formal dresses for women, but with a neckline of her choice (and ladies can skip the gloves). 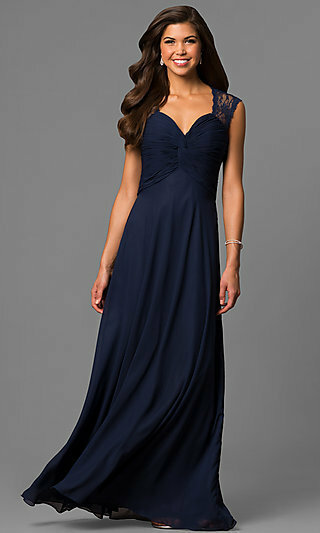 While young women are still expected to wear sleeveless long dresses, older women can wear evening gowns with cap sleeves or short sleeves. Men can wear a tuxedo without the tails and skip the white gloves, vest, and top hat, if desired. Black-Tie Gala: By far the most common, this type of gala usually means women opt for formal evening dresses or floor-length ball gowns with personally-preferred features and a tuxedo for men. You can go all out and channel your inner celebrity as you slip into a luxurious long formal evening gown with shimmering beads and sequins, or go for simple elegance in a sleek mermaid gown or a-line satin formal dress. For a black-tie-optional gala, women can still wear lavish black-tie dresses or opt for simpler styles, and men can wear either a tux or a dark suit with a black tie. Take full advantage of the chance to dress up your signature style in a floor-length chiffon evening gown or a curve-hugging long lace dress. Here you can explore an extensive selection of beautiful black-tie dresses, formal evening gowns, and elegant long dresses for galas. Often held at upscale venues with live music or other entertainment, galas and charity balls inspire a sense of magnificence worthy of a celebrity-inspired designer formal dress. Browse this collection of special-occasion gala dresses and black-tie dresses for galas that will make you feel like a glamorous celebrity while contributing to a worthy cause. Remember to let the invitation dress code, cause for the event, and your personal style guide your choice of gala dress. Then arrive with pride in your stunning formal evening dress and enjoy the champagne, dinner, dancing, and auction events while supporting a good cause at your black-tie gala or charity event.